The latest film in the 'Star Wars' series details the origin story for Han Solo. I hadn’t planned on seeing Solo: A Star Wars Story. As a matter of fact, I hadn’t seen any Star Wars movies except for the original. I never really caught the fever. However, I have been a Trekkie from a young age, preferring the more cerebral original Star Trek series and films, even if they are sometimes a little overacted. A couple of things piqued my interest in Solo. One was that Ron Howard had taken over as director of the film after disputes between the previous directorial team of Phil Lord and Christopher Miller and Lucasfilm. Lord and Miller supposedly saw the film more as a comedy, while Lucasfilm just wanted some comedic touches. The directors were also venturing too far away from the script by veteran Star Wars writer Lawrence Kasdan and his son Jonathan Kasdan. There were also disagreements about many different shots should be filmed of each scene in order to give more latitude in editing the movie. Howard has a proven track record of directing very successful films like Grand Theft Auto, Night Shift, A Beautiful Mind, and The Da Vinci Code. The other thing was that I had liked the Han Solo character, played in the original film by Harrison Ford. I thought it would be interesting to see Solo’s origin story. Other than knowing Howard was directing, I went in cold, having not even watched a trailer. 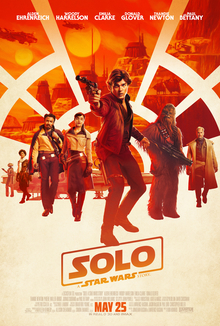 At the start of the film, we see Solo (Alden Ehrenreich), in his late teens, hot-wire a hover-car, so he and his girlfriend, Qi’ra (Emilia Clarke), can escape the not-so-pretty planet of Corellia. There they serve under a protectorate for orphans; in exchange for their shelter, they must steal and commit other petty crimes. Much like in Dickens’s Oliver Twist, they serve under a “Fagin-like” crime boss, Lady Proxima (voiced by Linda Hunt). She is a large water-worm-like creature, who isn’t much into the virtues of sun-tanning. They escape in the stolen hover-car and are chased by Proxima’s henchmen with their vicious species of “Hellhound.” Solo escapes to the spaceport, but Qi’ra is detained. He swears he will return for her. His life takes some unexpected turns until he finds himself working for a crime gang, led by Tobias Beckett, played by none other than Woody Harrelson (what a nice surprise!). I thought to myself that this is going to be an interesting ride. The gruffness of Beckett continually scrapes against the young brashness of Solo and makes for some interesting scenes. We also see Solo meet Wookie Chewbacca (Joonas Suotamo) for the first time and the initial important project they work on together. Beckett’s crime crew includes his wife Val (Thandie Newton) and Rio Durant (voiced by Jon Favreau), a small, turtle-like, four-limbed Ardennian, who is a seasoned pilot and who regales Solo and anyone within earshot with his tales of past adventures. He’s a fun character. Solo’s first caper with Beckett and company is pirating a valuable shipment of coaxium (a rare superfuel for faster-than-the-speed-of-light travel) from a double-decker train that is traveling alongside a mountain range on a single rail. The visual effects are breathtaking. They fight off robot guards and make off with the precious cargo, but encounter another group of outlaws riding sky-motorcycles who overpower them and make off with their loot. The crew then go to meet with Beckett’s crime boss, Dryden Vos (Paul Bettany), on his fantastical space yacht, where the food and music is out of this world. But this isn’t a pleasure cruise for Beckett and gang. They have fallen short in the mission and will be killed unless they come up with a credible scheme to replace the lost coaxium. A plan emerges from Solo’s bluff. They will go to the mining planet Kessel and steal the fuel in its unstable, unrefined state. On the space yacht, Solo reconnects with Qi’ra, who is now a lieutenant and love interest of Vos. Solo is ecstatic to see her, she is happy to see him too, but her current life has a strong gravitational pull on her. Vos is sending her on Beckett and Solo’s mission. Qi’ra and Solo later try to rekindle their previous love affair. All the crew needs now is a spacecraft, as their previous one was badly damaged in the last job. Qi’ra says “I know a guy, he’s the best smuggler around.” They head to a gambling club where Solo inserts himself into a high stakes, futuristic card game. As the stakes gradually increase, he brashly challenges his gambling rival, the flamboyant privateer Lando Calrissian (Donald Glover), to put his spaceship (the Millennium Falcon) up against Solo’s (which doesn’t exist). Winner take all. Solo loses and is soon found out, but Beckett cuts Calrissian in for a slice of the proceeds. Calrissian also brings his feminine robot pilot, L3-37 (voiced by Phoebe Waller-Bridge), who exudes both sexuality and individual empowerment to hilarious effect. There are good touches of humor throughout the film. As the expanded crew arrives at the Millennium Falcon, they are dismayed to see a huge parking ticket/non-payment boot secured to the landing gear. They disable it and are off on their mission. After flying through some challenging space territories, they land on the desolate mining planet Kessel. The mining planet is so desolate and scarred it looks like Appalachian mountains after mountaintop removal mining. After scamming their way in, they foment a miners’ revolt (It seems like conditions for mine workers have regressed in the Empire’s slave-worker mines on Kessel). After a long, pre-lift-off shoot-out with the mine guards (amazingly, the Falcon is not damaged too heavily), they fly back through an even rougher stretch of space. Chewie and Solo fly together for the first time, and the soundtrack references it with a subtle snippet of the main Star Wars theme. The soundtrack was created by the noted composer John Powell, and it used some of John Williams’s original score. Many twists and turns ensue to a suspenseful and pleasing effect. The entire cast did a fine job in their roles. Howard’s direction kept the suspense building and the action moving. It also helps to have a strong story to build upon. Solo: A Star Wars Story has not achieved the big numbers that were projected for the film. Some have said that there have been too many Star Wars films out in recent years, and there is a certain amount of fatigue with regards to them. It may be that this film is a little too far of a tangent from classic Star Wars themes. However, that is one of the reasons why I liked it, and I would like to see more of Solo’s backstory. There are options in place now to possibly create two more Solo films or include Ehrenreich in other related films as Solo. I believe the movie will continue to build and will be a respectable entrant into the famed franchise.